2016 MarCom Awards Now Open! No one has to tell you how crowded your industry is. In the U.S. alone, there are over 100,000 companies listed in local phone books that would love to help with advertising, marketing, graphic arts, public relations, web and digital. That number swells exponentially when you add all the individuals who work for those firms, plus freelancers and the tens of thousands who work for companies that employ their own creative staffs. In a growing swarm of creative firms and individuals, it is increasingly difficult to stand out from the crowd. Over the past 22 years, thousands of the world’s top creative firms and communication departments have turned to the Association of Marketing and Communication Professionals (AMCP) in search of third-party, earned recognition that would separate them from their peers. 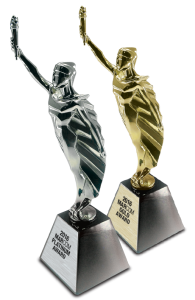 AMCP’s MarCom Awards, is one of the industry’s oldest, largest and most prestigious creative competitions. It is designed the way communication professionals want a creative competition to be run. Online entry is quick and easy, entries can be uploaded in seconds; fees are reasonable, so multiple entries can be submitted for various clients; work is judged on its own merits, not on time-consuming, imaginative explanations; results are unbiased and reported quickly, not months later when everyone has moved on to other projects and other clients. MarCom entrants can enter their pro bono work without charge. Over the past decade, AMCP has donated about $200,000 to charitable and needy causes. 2016 Hermes Creative Awards Now Open! You’ve won a 2015 MarCom Award. Now what? 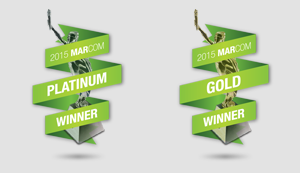 The results of the 2015 MarCom Awards have been announced. After you’re done with your celebratory dance, what’s next? Don’t just sit on this international recognition – shout your accomplishment from the rooftops so everyone from clients to peers and journalists are aware of your top-notch work. To help you get started with your promotion, here are a few ideas that hopefully won’t end with your neighbors calling the cops about noisy office neighbors. Carve out prominent space on your website to communicate your latest accomplishment. Even a small space on the homepage showcasing third-party recognition can give your team an instant credibility boost with potential and current clients. The same applies to email newsletters. Design pros can take readymade graphics from our library – available in JPG, PNG, PDF and EPS formats – and create customized banners for a polished, personalized look. If you’re not a designer, fear not. We’ve got you covered, too. All the graphics look grand out of the box. Winners have been posted to this years MarCom competition. See Winners, here.